Count Johann Herbart Auersperg was a General and Commander of the Military March. He was a descendant of the old, famous Slovenian Turjak Counts and a brother of Count Weichard, a powerful minister and favourite of the Emperors Ferdinand III and Leopold I. The catafalque was installed in the Jesuit St. Catherine's Church, Zagreb, when Count Johann Herbart Auersperg died in 1669. In the centre of the canopied hexagonal base with three steps is the sarcophagus, surrounded by six sculptures of famous Auersperg ancestors. Decorated with numerous candles and symbols in its entirety and signed on the bottom right IC Mannasser. There are also inscriptions, on the top left in a cartouche held by an angel: EXCELLMO AC ILLMO ... Anno salut 1669 Aetatis 56 and at the top right in a cartouche held by an angel: Ipso Die Exequiarum ... moestissimi erexerunt. Following the fashion of European funeral ceremonies also in Croatia, luxurious catafalques were made known as castrum doloris. Count Auersperg's social position suggests that a famous Austrian or Italian architect could have staged the funeral ceremony depicted in this print. These architects were in demand at the time to construct various complicated and spectacular performances, usually organised by the Jesuit Order, and designed to enchant the eye and spirit of viewers with the use of impressive effects. A bronze memorial plaque also in the church commemorates Auersperg's death. A Baroque catafalque was installed in the Jesuit Church of St Catherine, Zagreb for Count Johann Herbart Auersperg, General and Commander of the Military March, who died in 1669. 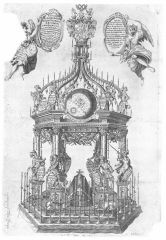 The catafalque shown in this print is typical of a Baroque funeral ceremony of the type staged by the Jesuit Order, and designed to enchant the eye and spirit of viewers with the use of impressive effects. A bronze memorial plaque, also in the church, commemorates his death. 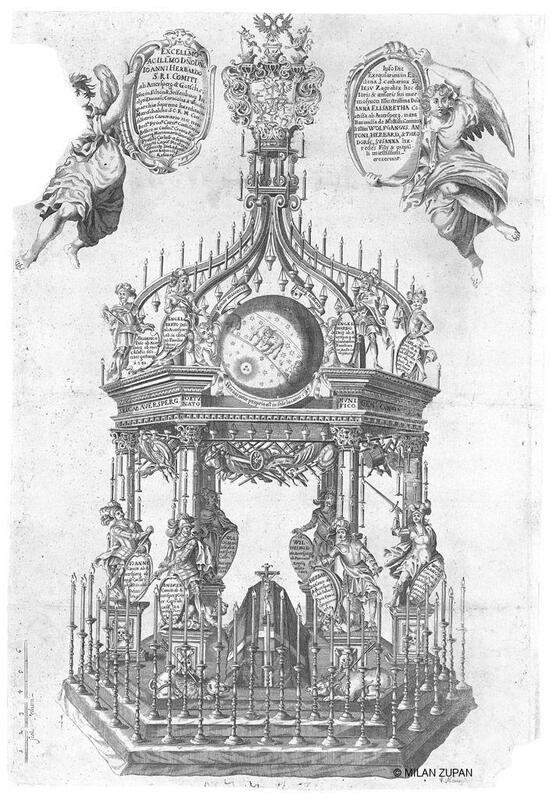 Purchased from Johann Weichard Valvasor by the Zagreb Archdiocese in 1690. Baron J. W. Valvasor, Slovenian polymath and collector, had his own mansion museum in Bogenšperg. Scarcity at the end of his life forced him to sell some of his exceptionally valuable holdings, and in 1690, the Zagreb Bishop Aleksandar Mikulić bought his collection of prints and the contents of his library. Od svagdana do blagdana. Barok u Hrvatskoj. Katalog izložbe (From Everyday to Holidays: Baroque in Croatia), exhibition catalogue, Zagreb, 1993. Pelc, M., Iconotheca Valvasoriana, VII. svezak, Janez Vajkard Valvasor Foundation, Zagreb Archdiocese, Ljubljana, 2004. Nela Tarbuk was awarded her BA in Art History and Comparative Literature from Zagreb University (Faculty of Philosophy). As head of the Museum if Arts and Craft’s Sculpture, Ivory and Musical Instruments collections, she has curated several exhibitions and written many articles. Her special research interests focus on sacral furniture. Exhibition catalogues include Culture of the Paulines in Croatia (1989), Jesuit Heritage in Croatia (1992), Peace and Virtue (2000), Hidden Treasures (2005) and Musical Instruments from the Holdings of the Museum of Arts and Crafts (2007).